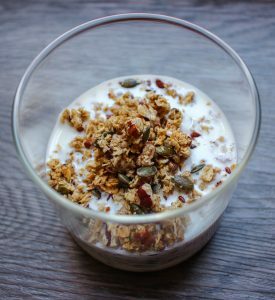 This granola recipe is easy to make doesn’t contain any refined sugar and salt like the shop bought varieties. It’s gluten free is a great source of vitamins, minerals and dietry fibre. Pre-heat the oven to 160C. Place oats, pecans, pumpkin and linseeds in a large mixing and combine. Divide the oat mix in two, placing on two clean baking trays. Bake in the oven for 15 minutes then remove the oat mix and return to the mixing bowl. Combine maple, honey, coconut oil and spices then using a spoon, mix the wet mixture into the oat mixture. Mix well then return to the baking trays and then the oven for a further 8 minutes. Remove the baking trays and set aside, allowing the granola to cool. Once fully cooled, transfer the granola to an air-tight container to enjoy as you wish!